TribeologyBlog.com – Episode #551 – WHY You Can Have Success! One of the biggest motivators you’ll find is “why” – and not “why” as in “why me”. The reason I’m bringing this up is because, well, yesterday some of you planned for an amazing day full of new starts! Hopes and dreams at the ready… it was New Years Day. With resolutions in hand to stop swearing or not eating sugar. Damn that Cinnamon roll before 9am! All of your “hard work” and resolute nature were GONE. Shoot gotta wait 364 more days. Last week I tried to share some insight to taking your hopes to the next level by actually converting them from dreams to GOALS. Setting specific milestones until you achieved success. Gotta have the goals. BUT more important is the WHY. What the heck did you want to give up swearing and sugar? Do you think swearing makes you sound bad? Do you not want to sound bad? Is sugar undermining your health? Do you get dizzy? If you do not want to be dizzy and you do not want to sound bad… these are WHY’s… even stronger “why’s” if you swear and eat sugar in front of your kids you are not a good role model and send mixed messages to them. This is also a powerful WHY. Also. Just because you swore and ate the cinnamon roll does not mean all hope is lost. Just start over. Consider it a “cheat” day and make better decisions with your WHY strongly in you mind. Success will follow! 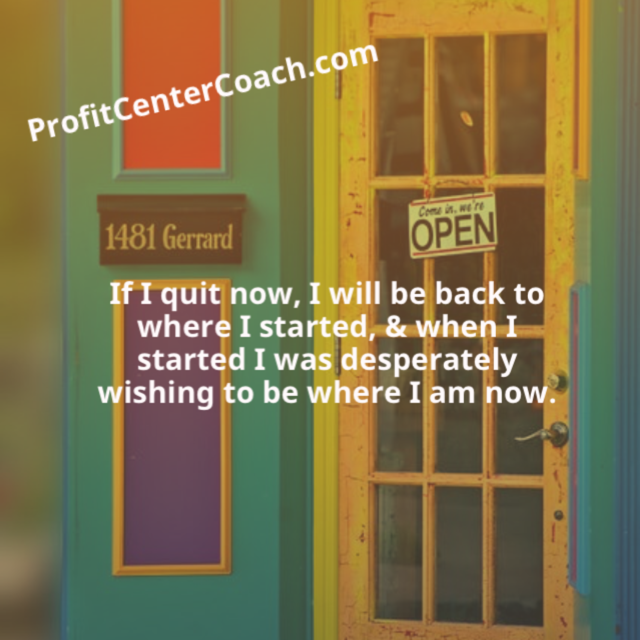 When you’re contemplating quitting, get out that sheet of paper with the reason why you started your business, read, focus, and keep going! That may sound like simple advice and it does not take into account the people that should truly stop their business. The majority of people, whether having a bad day, week, or even quarter, need to stop and pick up their “purpose” sheet. Look for motivation as to why you started your business and ask yourself if that is still the reason. Maybe your “why” has changed. Another thing that possibly happened is you’re off track. If you started out with a “hobby business” for extra money and now it’s the all consuming, every moment of free time, I’m not getting any sleep adventure with customers I genuinely don’t like, then maybe you need to reevaluate! Success comes with a price. It’s OK to raise your prices to reduce your customers (seriously, get rid of the bottom feeder bargain hunters that are crazy). In fact, if you are in this situation, I challenge you to evaluate how much “per hour” you are making. I’m not kidding. Track EVERYTHING. Your time is valuable, so if you create a post, if you order inventory, if you drive to the post office or office supply, if you email a client… track everything! I’m going to guess, because it’s usually the case, you are spending a lot more time than you think on the creation of a product or service. I did this with the embroidered dog collars I make. As soon as I figured out my actual time, I raised the price by $8 each. Sure, my orders fell off slightly, but now I’m making more than $4.73 a hour… (I’m not kidding about that hourly wage – a little shocking, don’t you think). A funny thing happens when you check out your why and then actually find the source of your problem (free time) – you “change lanes” and become happier! PS: If you are asking your self “what is this list of reasons?”… well, then it’s time to stop and make one! 2-How much do you make per hour / or per job – I mean really make… it’s time to “job cost” your output! This will determine if your pricing is satisfactory (with you) – it’s not just if you turn a profit on materials, YOU need to get paid for YOUR time!! !